Cover sleeve for Capitol Records EP with 1955-56 hit song “Sixteen Tons” by Tennessee Ernie Ford. Click for EP collection. The top song in America during late 1955 and early 1956 was a tune about coal mining — a song about the hard life and poverty of being a coal miner. Its title was “Sixteen Tons” and it was made popular by a singer named Tennessee Ernie Ford. The song had actually been written in the 1940s, its verse grown piecemeal from oft-heard phrases and the lives of miners dating to the 1930s. And although “Sixteen Tons” had been previously recorded in the 1940s, it wasn’t until the 1950s that it became a big hit. In 2015, “Sixteen Tons” was recognized for its cultural significance by the U.S. Library of Congress. and was adopted into the National Recording Registry. A later DVD volume of Merle Travis music. Travis’ version of “Sixteen Tons” was released by Capitol records in 1947 on Folk Songs of The Hills. But the song did not receive much notice. In fact, during the Cold War hysteria of the late 1940s, songs dealing with workers’ woes by “folk music activists,” as they were called, became suspect. Ken Nelson, a Capitol record producer who had also worked at WJJD radio in Chicago in the 1940s, later explained in 1992 that FBI agents advised the radio station not to play Travis’ records because they considered him a “communist sympathizer,” which Travis was not. Although his version of “Sixteen Tons” — produced with a single guitar — did not become a hit, Merle Travis continued his music career, becoming one of the most highly regarded country guitarists in history. His “Sixteen Tons” would be made famous by Tennessee Ernie Ford. Ernie Ford in Capitol recording session. Ernest Jennings Ford was from Bristol, Tennessee, where in high school his baritone voice had first been noticed. After a stint in the military during WWII, he adopted the stage name “Tennessee Ernie.” He began his career as a singer of country music on radio stations in San Bernardino and Pasadena, California. By 1949, he signed a contract with Capitol records, had a few hit records and also became a local TV star on the popular Southern California show, Hometown Jamboree. In 1954 Tennessee Ernie Ford became nationally known through his several appearances on the I Love Lucy TV show as a visiting “country cousin.” Ford knew the “Sixteen Tons” song from working with Merle Travis who had appeared on Hometown Jamboree. Ford’s grandfather and uncle had also worked in the mines. In early 1955, Ford did a version of “Sixteen Tons” on television. Within five days, NBC received over 1,200 letters from viewers asking about the song. In July 1955, Ford performed the song again at the Indiana State Fair before a crowd of 30,000 and the response was “deafening,” according to one report. Label on 78 rpm version of ‘Sixteen Tons’. Capitol Records, meanwhile, informed Ford in September 1955 that he needed to produce a new record to meet the terms of his contract. Shortly thereafter, a two-sided single was produced. “You Don’t Have To Be A Baby To Cry” appeared on the “A” side and “Sixteen Tons” on the B side. Capitol believed that the A-side song was destined to be Ford’s biggest hit yet. On October 17th, 1955, Capitol shipped the new record to radio DJs who began playing the B side, “Sixteen Tons.” In about ten days’ time, the record promptly sold 400,000 copies. Demand for “Sixteen Tons” became so great that Capitol geared all its pressing plants nationwide to produce the record. In less than month after its release, over one million recordings of “Sixteen Tons” were sold. It became the fastest-selling single in Capitol’s history. Sample album sleeve, 'Sixteen Tons'. “Sixteen Tons” hit Billboard’s Country Music charts in November 1955, and held the No. 1 position for ten weeks. By December 15, 1955, more than 2 million copies were sold, then making it the most successful single to date. But there was still more notice for the song, as it crossed over to the pop music charts in early 1956, holding the No. 1 position there for eight weeks. A mind that’s weak and a back that’s strong. Well, I was born one mornin’ when the sun didn’t shine. I picked up my shovel and I walked to the mines. Well, I was born one mornin’, it was drizzlin’ rain. Fightin’ and trouble is my middle name. I was raised in the bottoms by a mama hound. I’m mean as a dog, but I’m as gentle as a lamb. WeIl, if you see me a-comin’ you better step aside. A lotta men didn’t and a lotta men died. I got a fist of iron, and a fist of steel. If the right one don’t get you, then the left one will. Coal mining town of Dehue, West Virginia showing a 1934 labor march. The song’s lyrics also aimed at the dangers and exploitation of the coal mining life — and the hard times in coal mining communities. And indeed, from the early 1900s through the 1940s, life in the coal mining communities all across the country was pretty grim. Mine workers were frequently killed in mine accidents and most who worked in the mines developed “black lung” disease from years of breathing coal dust. Although mine conditions improved following the unionization of mine workers in the 1930s and subsequent mine safety laws, even in the mid-1950s when “Sixteen Tons” was at the top of the charts, mine accidents and deplorable conditions in mining communities were still found throughout the coal fields. And as “Sixteen Tons” made plain in its lyrics, indebtedness to the company was also a problem in some coal communities, especially before labor reforms were adopted. Coal miners often became indebted to the “company store,” also known as the general store in some locations. With no competition, the company could keep prices high for everyday items, and employees — especially those with families — often needed to pay in credit with tokens or scrip. A never-ending cycle of debt often resulted, meaning essentially that the workers were perpetually bound to the company. September 1946: Miners and their families gather around the company store and office, Lejunior, Harlan County, Kentucky. Miner working in a confined, cramped position inside a narrow coal seam on a piece of equipment called a ‘lizard.’ (photo, Earl Dotter). Although mine safety has generally improved over the years — and “Sixteen Tons” spoke largely to an earlier era — coal mining accidents were still occurring through the 1950s and 1960s, as they have to the present day. In December 1951, for example, the Orient No. 2 mine in West Frankfort, IL exploded killing 119 miners. In Farmington, WV, the Jamison No. 9 mine exploded in November 1954 killing 16. And in McDowell County, WV, the Bishop No. 34 mine had two fatal explo- sions in the 1950s — one on February 1957 that took 37 lives, and another in October 1958 that killed 22. The 1960s saw more of the same. A March 1960 mine fire killed 18 in the No. 22 mine at Pine Creek, WV. Suffocation took the lives of 6 workers in a Dora, PA mine in June 1966. And in 1972, a collapsed coal wastewater impoundment at Buffalo Creek, WV killed 126, injured more than 1,000, and displaced thousands more after flooding several downstream communities. 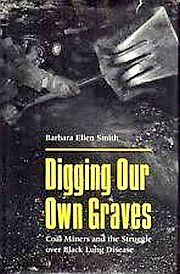 “Digging Our Own Graves,” 1987 book about black lung disease. "Sixteen Tons" record sleeve photo. “Sixteen Tons” caught on all across the country in 1955 and 1956, as it offered a distinctly different sound; somber and fatalistic, in sharp contrast to the up-beat pop ballads of that day. Rock ‘n roll was just starting its rise to prominence then. Still, the lyrics of “Sixteen Tons” offered memorable lines and helped bring the plight of miners more into general pubic awareness at that time. Some listeners were also thought to identify with the tune in their own lives, as they too were living on credit or stuck in never-ending jobs, seeing themselves as “owing their souls” to a kind of “company store.” In any case, Capitol Records was certainly happy, as “Sixteen Tons,” along with other songs, helped improve 1955 sales to a record $21.3 million, up 25 percent over 1954, with profits up by 33 percent. In a 1990 Associated Press story, Ford was quoted as saying the recording had sold 20 million copies by then. Cover of 'TV Guide' in March 1957, one of four he would appear on. Tennessee Ernie Ford, meanwhile, went on to a successful TV career hosting prime-time network music and variety shows from 1956 to 1965. Ford proved a versatile performer, cutting across comedy, film, and various music genres, including country, pop, gospel and religious music. Ernie Ford also appeared in Hollywood films, sang the title song for the 1954 Marilyn Monroe/Robert Mitchum film, River of No Return, a song which became a pop hit. He also did the “Ballad of Davy Crockett,” another hit record in 1955. On television, he received national notice as “Cousin Ernie” on the popular I Love Lucy show in 1954 when he played the humorous country cousin of Lucy Ricardo. Ford’s music career continued as well, in fact through the 1970s, as he completed a 1975 album with Glen Campbell, as this and other music from his past enjoyed a second life with new listeners and CD sales in the 1990s. At age 71 in 1990, Ford was inducted into the Country Music Hall of Fame. He passed away the following year due to liver cancer. 'Music of Coal: Mining Songs from the Appalachian Coalfields', Box set, 2 CDs with 69-page booklet. Library of Congress, "Songs & Ballads of The Bituminous Miners." “The Wild Birds Do Whistle,” Time, Monday, December 19, 1955. “High-Priced Pea Picker,” Time, Monday, May. 27, 1957. Pete Martin, “Tennessee Ernie Ford Interview.” Saturday Evening Post, September 28, 1957, p. 124. Archie Green, Only a Miner, Urbana, Illinois 1972, pp. 301-302. George Korson, Coal Dust on the Fiddle, Hatboro, Pennsylvania, 1965, pp. 72-73. George Vecsey, “Strike Frees Miners From ‘Dungeon’ Peril”(Dante, VA), New York Times, Saturday October 2, 1971, p. 16. Herbert C. Bardes, “A Chronicle of Coal Company Scrip,” New York Times, Sunday, April 1, 1973, p. 183. Leonard Sloane, “The Company Store Comes Out of the Coal Mines; The Company Store, Revised for 1975,” New York Times, Business & Finance, Sunday, June 22, 1975, p. 147. “Kentucky Coal Area Recalls Days of Token Money”(Dunmor, KY), New York Times, Sunday, May 4, 1980, p. 59. Ace Collins, The Stories Behind Country Music’s All-Time Greatest 100 Songs, New York: Berkeley Publishing Group, 1996, pp. 91-93. The Billboard Book of Number One Hits (fifth edition). “Sixteen Tons: The History Behind the Legend,” formerly at: ErnieFord.com. Rhonda Janney Coleman, “Coal Miners and Their Communities in Southern Appalachia, 1925-1941” West Virginia Historical Society Quarterly, Volume 15, Nos. 2 & 3. Dehue, West Virginia, “Past & Present: Another Day Older…” (Dehue labor photo from this site). “Coal Mining Disasters,” (incidents with 5 or more fatalities), NIOSH Mining Safety and Health Research, National Institute for Occupational Safety & Health. Tennessee Ernie Ford website, TEF Enterprises, LP. “National Recording Registry To “Ac-Cent-Tchu-Ate the Positive,” Library of Congress, March 25, 2015.